Is Hong Kong's media under attack? The motive is unclear and police have so far made no arrests. But many media workers believe the stabbing was linked to Mr Lau's record of pushing journalistic boundaries during his time as editor of major daily Ming Pao. And journalists, academics and political analysts say the assault, while shocking, is only the latest in a string of events pointing to a noticeable trend. In the past year, there have been half a dozen violent attacks on workers employed by media organisations critical of the Hong Kong and Chinese governments. Over the same period, the abrupt dismissals or resignations of several outspoken journalists have led to accusations of censorship. "Freedom of press and speech in Hong Kong is increasingly under pressure," says Bruce Lui, a journalism lecturer at Hong Kong Baptist University and a former television reporter. "Especially since the second half of last year, it's happening more frequently and with increasing force. We believe these are not individual cases. It appears someone has a whole plan to censor the Hong Kong media." Media groups - including the Hong Kong Journalists Association, Foreign Correspondents' Club, Reporters Without Borders and the Committee to Protect Journalists - as well as the US government have all expressed their concerns about perceived recent erosion of press freedom here. Hong Kong is part of China, but enjoys many civil liberties, such as freedom of speech, expression and assembly, because of its status as a special administrative region. A former British colony, it reverted to Chinese rule in 1997. Worries that Hong Kong would immediately become just another Chinese city subject to similarly authoritarian rule never materialised. It remains home to an outspoken and vibrant media - in Reporters Without Borders' World Press Freedom Index 2013 it stood at 58th globally, only slightly below Japan and South Korea, and far above China at 173. But after years of relative tolerance, the Chinese government is starting to tighten its grip on local media, according to Willy Lam, a China specialist at the Chinese University of Hong Kong. "It's mainly to show people in Hong Kong that Beijing is the boss and they do not want Hong Kong people to have the illusion that they can force the hand of Beijing," he says. Hong Kong has become a far more restive city in the past two years. Much of the anger against Beijing is due to the lack of political change there and in Hong Kong. Some pro-democracy activists have called for a civil disobedience campaign, called Occupy Central, to demand progress towards genuine reforms in the city later this year. And groups of angry residents are regularly taking to the streets to protest against what they say is the "invasion" of mainland Chinese tourists and shoppers. Some protesters even carry the former colonial flag, symbol of a fringe independence movement, unnerving many Chinese officials. The mainland's financial might makes it easier to pull strings when needed. Reporters Without Borders wrote in a recent report: "China's growing economic weight is allowing it to extend its influence over the media in Hong Kong, Macau and Taiwan, which had been largely spared political censorship until recently." Mainland Chinese companies now account for more than half of the value of Hong Kong's stock exchange, compared to a negligible amount before 1997, according to estimates from David Webb, an independent analyst. According to the Committee to Protect Journalists, more than half of Hong Kong's media owners are now members of China's parliament or its advisory body. Other media owners, such as the Malaysian billionaire Robert Kuok of the South China Morning Post and fellow Malaysian Tiong Hiew-king of Ming Pao, have major business interests in China. Leung Tin-wai, a former publisher and head of the journalism department at Shue Yan University, believes overall media freedom has not changed much in the years since the handover. "It's almost the same as before. In fact, at the moment, the government is afraid of the press. They allow us to have a say and to have our comment," he says. But Mr Leung, who was attacked by suspected triad members in his office in 1996, does admit that the political and financial dynamics have changed. In his heyday, the people who bought advertisements in his publications were almost entirely local tycoons. Now, many of the advertisers are mainland companies. Shih Wing-ching, publisher of the free AM730 newspaper, wrote in a January column that a group of long-standing advertisers, all mainland companies, had suddenly pulled their ads, leading to worries they were trying to influence the daily's independent editorial stance. Self-censorship, meanwhile, is also an issue. According to a 2012 survey by the Hong Kong Journalists Association of more than 600 members, 79% of respondents said self-censorship was more severe than in 2005. Even before Kevin Lau was attacked, his colleagues harboured fears about the loss of editorial freedom. His employer, Ming Pao newspaper, announced in January that Mr Lau would step down as chief editor and be replaced by a Malaysian journalist. More than 90% of staff signed a petition demanding an explanation from management. "We had two basic requests. We wanted to know what really happened. And we wanted to know whether Kevin's replacement meant any change in editorial policy," said Phyllis Tsang, spokeswoman for the Ming Pao Staff Concern Group. They demonstrated against the move, demanding to know whether it was an attempt to rein in investigative journalism at the well-respected newspaper, something the management has denied. Ms Tsang says the paper broke many stories under Mr Lau's two-year tenure, including the discovery of an illegal basement belonging to the heavily-favoured candidate for the 2012 chief executive election, which resulted in his losing the race. Earlier this year, Ming Pao worked with the Washington-based International Consortium of Investigative Journalists to write stories about the finances of Chinese officials and business people. After Mr Lau's dismissal, several columnists left their pages blank in protest. 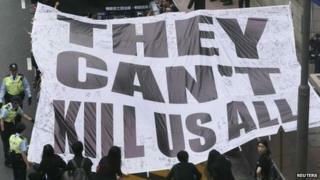 In the days following the attack on Mr Lau, media groups organised a weekend protest attended by more than 8,000 people demanding police apprehend the perpetrators. The journalists have vowed not to be cowed by the violence and to continue publishing more investigative reports, despite the apparent growing risks.